Monday, Monday, here you are again. I hope everyone has had an enjoyable weekend despite having to think about all the craziness that is going on in the world. Throughout last week, I honestly cannot find the words to express the way I felt about the events over in Boston and down in Texas – and now there's the earthquake over in China. All my thoughts and prayers are with those affected by these terrible tragedies! 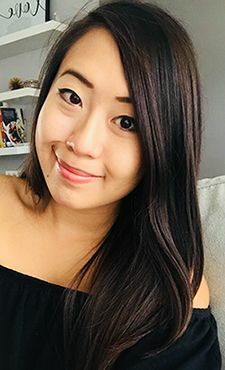 So because it’s been terribly gloomy both in the news and weather wise here in Edmonton, I’ve got a cooler toned polish on my tips this week to reflect that. 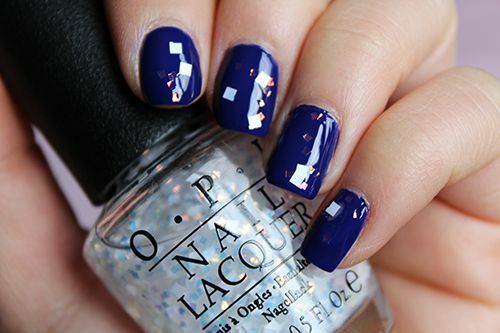 OPI’s Eurso Euro from the Euro Centrale collection is a deep navy blue that dries to an intense glossy finish. One thin coat was actually opaque, but I finished with two to deepen the hue and level out the polish in the pictures above. OPI’s Oz Great and Powerful collection has some beautiful top coats, so I’ve used Lights of Emerald City to finish off this manicure. The large white square glitter and smaller translucent ones give the clear polish a unique depth and gives any manicure a mod vibe. The only downside is that it was hard to apply the squares to the nail, so it takes a little patience and some repositioning to get the look you want. Otherwise, I’m really loving these new glitter topcoats the company is bringing out! Here’s to hoping this week is better than the last! Agree Andrea! Last week was horrible. There was just one bad event after another. Despite not living at any of these places, I felt depressed. The tragedy is just horrific. So yes, I had the blues too. 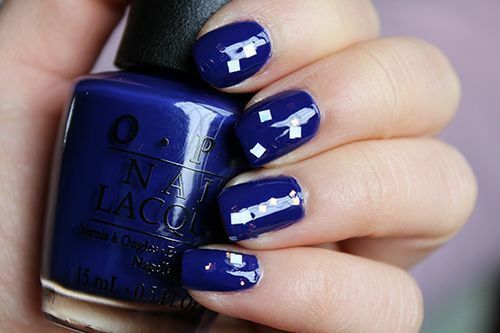 That's a lovely navy and I love the extra sparkles. Have a better week. 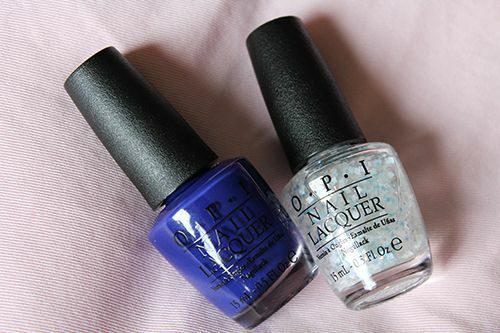 such a gorgeous shade of blue and the top coat is really pretty. It adds just that last little something. Wow, those are gorgeous! I love that polish! I love the gorgeous outcome of the blue coat!!! It's so perfect, Ms. Andrea!!! What is this new nail craze? Was it always this big or is it something that has just grown in popularity over the past few years? I'd definitely say its been growing in popularity over the years - especially with nail art. Hey Andrea, such a luxurious color and obviously your nails too. :) Hey, I wanted to ask you how to wear white polish. I have a bottle and I tried it the other day, I felt like I was putting liquid paper on my nails. Haha. How would you wear white polish? i love it the deep blue!